History of Sailing Yacht Masts, Rigging and Sails - Mast Materials and Manufacturing. These were in common use throughout the world. The material is cheap and easy to manufacture. Cotton, being a natural fibre, has poor resistance to rot, UV light and water absorption. These qualities made it unsuitable cloth sailcloth for high performance racers. These qualities steered the sailcloth industry to consider new materials and to develop new methods of manufacture in order to increase the resistance to environmental and mechanical damage. Laminated and composite sail cloth. The latest advances have been in laminated sails, like the North sails 3DL (3-dimensional laminate) cloths. These cloths have the fibres orientated in line with the principle loads. This enables the sail to be made lighter and stronger than standard polyester or even conventional laminated sails. There is a wide range of cloths available from polyester fibre laminated sail-cloth for use on cruising boats up to cuben fibre laminated clots which are used in IACC yachts and other high performance yachts (like VO60's and open 60's). The more one pays for the cloth the stronger, lighter and better resistance it has to stretching. The main advantage with using laminated cloth is that the sail will hold its shape better and for longer than a polyester weave. 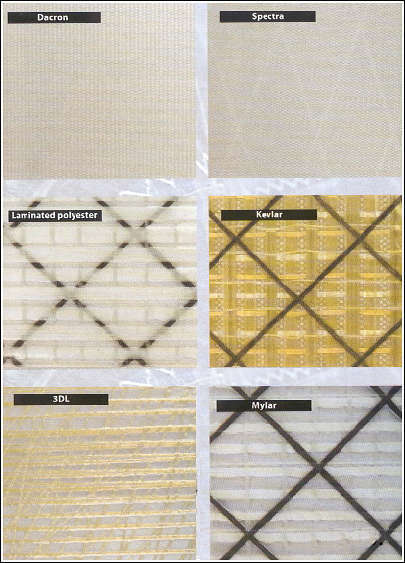 Fig 6 shows the main reasons why laminate cloths are superior to woven. In a laminate cloth there is virtually no crimp. This means that the cloth produced is stronger and more resistant to stretching. Fig 7. Shows how a laminate is arranged, in this case the spectra scrim is the primary load carrier, the Mylar film is what holds the spectra fibres in place and offers protection to the spectra, the polyester taffeta back is for the abrasion resistance and offers a high level of overall protection to the laminate. This arrangement is the common form used for cruising cloths. The reason being that it is a heavier more durable laminate than what is used for racing boats. A disadvantage, which the laminated cloths have in common with the other cloth types, is the damage that is done to the sail from UV rays. This is common to most types of cloths. New films for the laminating process are being developed to combat UV rays but none has yet achieved a cloth, which is totally resistant to UV rays. In the beginning of the 20th century the most common sailcloth's were made with cotton or flax. Cotton, being a natural fibre, has poor resistance to rot, UV light and water absorption. These qualities made it unsuitable cloth sailcloth. Nylon was one of the 1st man-made fibres to be used for sailcloth. The chemical formulation and general properties of nylon have changed little over the intervening years. It is a cheap, durable and relatively resistant to UV light, good flex-fatigue resistance and shows middle of the road strength properties. However Nylon is mostly restricted to use in spinnakers due to its poor stretch resistance. Even for spinnakers it is not the ideal material as it can absorb as much as 3% its own weight in water. The most important development occurred in the mid 1950's when polyester sailcloths were developed. Until the 1980's the only widely used sailcloth was woven polyester (or Dacron, Dupont's trade name for their polyester yarn). Dacron is a very durable sailcloth and is resistant to mould and water absorption. Dacron is also very durable making it an excellent sailcloth. Woven sail clots have an inherent problem with its stretch resistance. Some yarns pass over and under one another. Over time as load is applied these yarns attempt to straighten out, this results in the fabric stretching. This is commonly referred to as crimp. This lead to the development of laminated cloths where the fibres are laid is straight as possible. A further development of polyester occurred in the 90's with the development of PentexTM. A derivative of polyester which 2 and a half times the elastic modulus of traditional polyester. Which makes for sailcloth which is more resistant to stretch and holds its shape longer. In the mid eighty's sail makers began the development of laminated sails. These were to be developed for America's cup yachts and over top end racers. The reason these were developed was that the resulting laminate is lighter, stronger and more stretch resistant. North sails use large moulds mounted on hydraulics, these moulds can change shape to the desired shape of the sail. Then with a combination of robots and people suspended over the mould laminate films and fibres are laid down, consolidated and heated with an infrared lamp. The fibres are laid in a precise manner by a robotic arm, which lays them along the lines of principle loads. The resulting sail is extremely light and holds its shape much better than a sail made by stitching fabric together. The drawback of this method is that the capitol investment in the machinery and technology needed is huge. There is currently only one manufacturing centre for 3DL in the world, located in the US. There is doubt on whether north sails can keep manufacturing these sails, as there is a bitter dispute with Genesis about Patent issues. North sails were accused of breaching Patent and copyright law with the use of 3DL and if Genesis gets its way then North Sails will be forced to discontinue production. The Genesis system is similar to the North sails system, the difference being that they don't use a large moveable mould like the 3DL system. Figure 10 is a representation of the types of sail cloth available. The 3DL in fig 10 clearly shows how the fibres run in the direction of the loads. The black cross weave on the bottom 3 sail clots in figure 10 are simply dyed fibres to make the sail look better. The latest development in sail technology was the Introduction of Cuben fibre. This was given its first major test aboard "team adventure" which was the Giles-Olier super cat, which took part in "The Race" in 2000. There were no major problems with the sails as the Cat powered its way round the world. At the start of the race there were light winds it could be sent then that the Cuben Fibre sails were performing very well. Team adventures speed was higher that that of her sister ships which were using older tried and tested sailcloth's. In the same race the super cat "Playstation" used a new suit of Cuben fibre. These were not as successful as aboard "Team adventure" this was put down to the factors of safety, which the "Playstation" designers used, was not nearly as much as "Team adventures". There is no doubt that Cuben Fibre will become widely used for sails in the future, its only drawback at present is its prohibitively high cost. As its usage in the marine industry is increased this price will fall. Cuben fibre is a combination of different fibres the precise fibres that they use has not been disclosed. At the time it came out people assumed it was some new exotic type of fibre similar to carbon fibre, this is not the case. It is manufactured in a unique process whereby large panels are laid up with as many as 7 different layers of yarn. This is lightly bonded to a Mylar substrate, which is in turn heated and pressurised in an autoclave until the layers become one. The resulting sail produced is extremely light, waterproof and has unequalled strength and stretch resistance. The laminate has the feel of heavy plastic, this means that sail repairs are easy to carry out; patches can be made up and glued on with a hot glue gun. There has been an increase in the last decade of the use of full batten systems. These systems enable the sail designer to make the final sail conform to a better aerodynamic shape. The recent development in composite technology has enabled battens to be manufactured, which were both light strong and flex correctly. Noticeable increases in speed can be seen with the use of full batten systems compared to normally battened sails. Vectran is a fibre the US navy developed. The US navy wanted a fibre to listening devices behind submarines. The requirements for the fibre were for the length of the tow to be constant and one, which could withstand adverse conditions. The result of the research was Vectran. It is a liquid crystal polymer, which shows similar initial properties to the commonly used grades of Aramid. Flex fatigue resistance is much higher than Aramid fibres; its UV resistance is slightly lower. However it is considerably more expensive than Kevlar. Current applications for this cloth are in endurance events such as the Volvo ocean race. PBO was developed in the late 90's and was heralded as the new wonder material. It has higher stretch resistance than any other material, except carbon, and very high initial strength. It has one major drawback, poor light resistance. Research showed that the fibres were damaged by visible light and therefore that led to further developments in film technology to combat this problem. At present this cloth is reserved for use in high-end racing such as the America's cup and grand prix racing. The improvements in sails in the next few years are going to be in the mixture of fabrics which complement each other and go into making better sails.